South Australia is expected to have its very first farmer and private equity partnership port built and in operation for the 2018-2019 grain harvest. 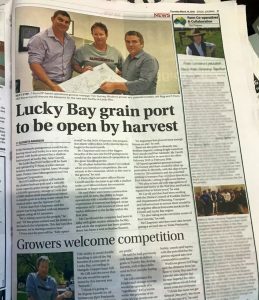 The port has been proposed to be built at Lucky Bay on the Eyre Peninsula and will provide an alternative grain storage and export option for local Australian growers. 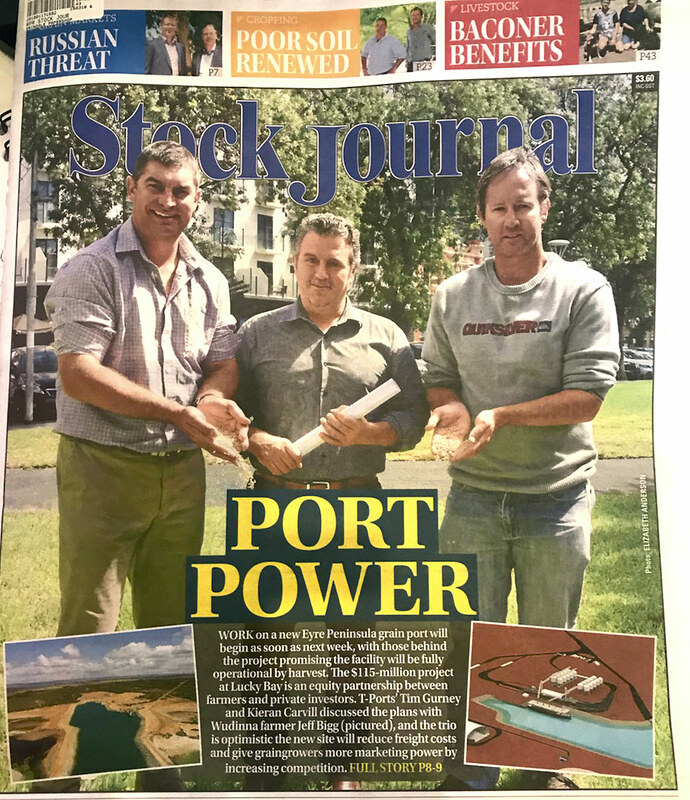 These growers will acquire equity in the port over the next seven years and are expected to save from $5.00 – $20.00 per tonne in transporting grain from farm to port, depending on their proximity to Lucky Bay. After last year’s expression of interest phase where 120 EP grain growers gave their support for the new port, the new $115 million infrastructure and supply chain project was officially finalised this past week and on-ground works are due to begin immediately. The Lucky Bay Port Facility – This is a shallow harbour port located in the upper Eyre Peninsula grain catchment zone. Transhipment Vessel – The port will have a cutting-edge shallow draft transhipment vessel, with an approximate capacity of 3,400 tonnes, that will allow Panamax vessels to be loaded within the five-day industry standard. This new vessel, designed by the naval architects at Sea Transport Solutions – specialists in transhipment vessel design and operation, is currently under construction in China. Grain Storage Facilities – New storage facilities located at the port will have an approximate capacity of 430,000 tonnes. Up-country storage at Lock – Storage capacity of 150,000 tonnes. The development of the new port has been a joint venture between Duxton Asset Management, Inheritance Capital Asset Management (ICAM) and Sea Transport Solutions. This joint venture has resulted a new company dubbed ‘T-Ports’, an abbreviation of transhipment ports, that will act as the operating entity following settlement. T-Ports’ Chairman Rob Champan stated that the company’s ports infrastructure strategy focuses on establishing a more financially feasible ports model. This includes providing both shallow water ports with a lower build cost and smaller environmental impact requiring modest throughput and providing sound financial returns to investors. 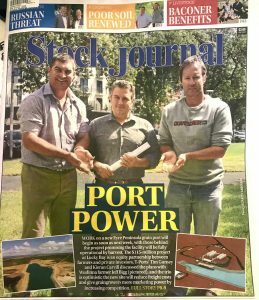 The ports will be multi-user and multi-commodity transhipment ports, with the first at Lucky Bay and a second under investigation for the Yorke Peninsula. “South Australia is in need of new export infrastructure in order to improve agricultural economics and allow development of its mining assets in an increasingly competitive world environment,” Said Mr. Champman. “While this port development is based on agricultural product, it can readily expand to allow exports of local minerals and T-Ports will be pursuing opportunities to further diversify and grow the commodity base”. T-Ports’ CEO Keiran Carvill says that clear direction from growers has been to increase supply chain efficiency which we will achieve through Lucky Bay as a low capital expenditure and flexible port close to the product origin. “This investment innovates upon the traditional port model and almost monopolistic grain supply chain in South Australia through proven transhipping technology that has been utilised in other industries for the past 20 years,” said Mr Carvill. Andrew Polkinghorne, Lock grain grower and T-Ports Board Member, stated that the Lucky Bay development has been the breakthrough that man EP growers were waiting for in the supply competition. Mangalo farmer Isaac Gill, whose farm is approximately 60 kilometers from Lucky Bay, agreed stating that the Lucky Bay development will help save growers a lot of money in the long run. “It’s fantastic because we are going to save off our bottom line extra freight which we have been doing down to Port Lincoln and we often can’t deliver straight to port at harvest time… now we will be able to deliver it straight off the header, straight out of the paddock and straight to port and it could be saving us around $15.00 a tonne” says Gill. Sea Transport Solutions is excited to be a contributor to the Lucky Bay port development and will publish further information on its progress as it becomes available. For more information on Sea Transport’s transhipment vessel design, management and feasibility services please click here or call our head office on +61 7 5529 5777.